I spent yesterday in Cincinnati. I was there for the TED x Cincinnati. (Thank you co-chairs Michael Bergman, David Volker, Emily Venter and Mary Riffe for inviting me. Thanks also to Trey Smith, Carla Inman and Joe Rigotti). I got to see the city from two points of view. Cincinatti was the first inland American city. In the 19th century, it was a long way from other big centers of population. It needed a product valuable enough to still be valuable when it got to market. Here is the Cincinnati solution. The city had lots of corn. It turned this into spirits (boubon), cows and pigs. The spirts could be put right on a boat and sent to New Orleans (say). But the cows and pigs needed another transformational cycle. They needed to be turned into tallow and wax, and these needed to be turned into soap and candles. (This is where P&G came in.) These products went to off to market and into the lives of consumers who completed the cycle by turning the spirits into illumination, pleasure, abandon, debate, and commotion of several kinds, the soap into cleanliness (and this, as we know, into godliness) and the candles into illumination of a lesser kind. One of the TED presenters was Patricia Van Shaik who, as the head of the Local History Collection of the Public Library of Cincinnati, is the keeper of one of the most extraordinary images of American life in the 19th century. Her presentation was a tour of the Cincinnati Riverfront Panorama (top image shows a partial view). 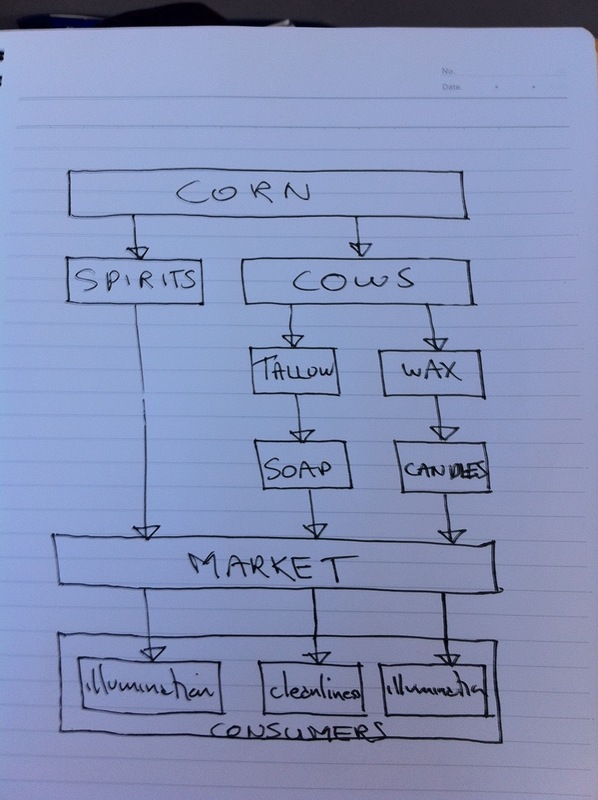 While the Jerry’s vast transformational process was turning corn into products and products into profits, here was Cincinnati at the beginning and the end of the transformational cycle. Patricia took us through the fine detective work that determined the exact moment the Daguerreotype was made in 1848. We don’t know much about Charles Fontayne and William Porter, the men who made it. And we can’t be certain what their motive was. (It doesn’t look like it was commercial.) It is a miracle that this image was taken and a bigger miracle still that it survived to the present day. The Panorama shows us the riverboats that took products to market and profits home again. It shows us the ads on shore that shouted out to river traffic, encouraging people to stop in Cincinnati and shop there. (The 19th century equivalent of the cruise ship phenomenon?) A lot of city life was seared into these plates. Most poignantly, we can see a stream carrying human waste into a river. Downstream we can see kids drawing water from the river. Patricia showed us the local newspaper reports that covered the outbreak of cholera a week later, and the names of the people carried off by it. Patricia and her team are committing this treasure to a website and someday we will be able to wander it. There is coverage in Wired (see reference below) and it’s hard to imagine that Ken Burns has not heard of this image and considered it as a center piece for one of his magnificent documentaries. So there it was. Cincinnati as a transformation and a snap shot, a process and a moment, a creator and an outcome, an engine and an artifact. Thank you, Jerry. Thank you, Patricia. Thank you, WebxCincy. Rehmeyer, Julie. 2010. 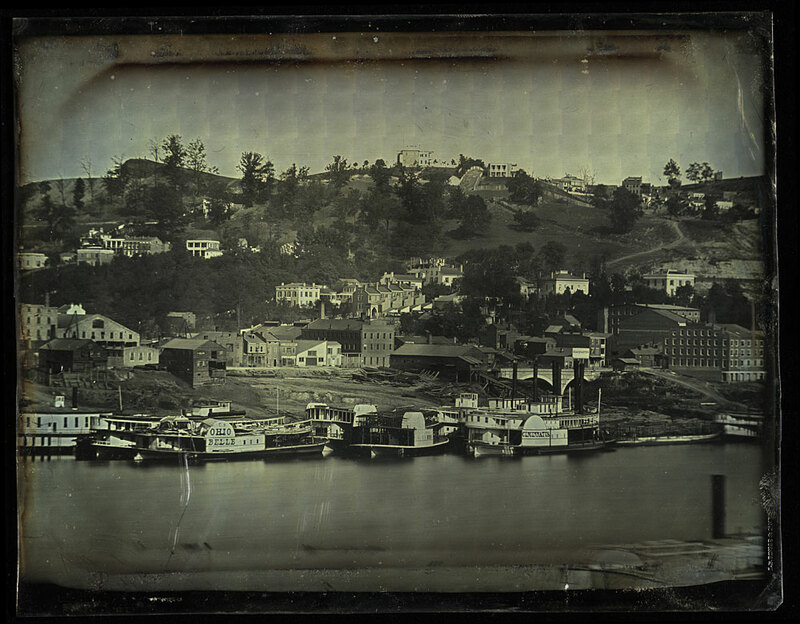 “1848 Daguerreotypes Bring Middle America’s Past to Life.” Wired Magazine, July 9 http://www.wired.com/magazine/2010/07/ff_daguerrotype_panorama/ (Accessed October 8, 2010. This entry was posted in Uncategorized and tagged Carla Inman Joe Rigotti, Charles Fontayne, Cincinnati, Cincinnati Riverfront Panorama, Daguerreotype, David Volker, Emily Venter, Jerry Kathman, Julie Rehmeyer, Ken Burns, LPK, Mary Riffe, Michael Bergman, Patricia Van Shaik, Public Library of Cincinnati, TEDxCincy, Trey Smith, William Porter on October 8, 2010 by Grant.